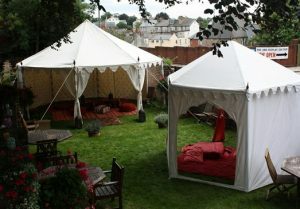 This is the very beautiful Moroccan Theme Party Tent – The Ottoman Tent. The striking combination of Gold Top and Red Walls have been specially created for our client. He has an event company that does only high profile weddings. 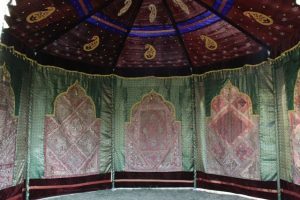 This extraordinary Ottoman Tent is erected on a Metal frame structure and has Arch shaped doorways on all the sides. The entry to this beautiful tent can be from any one side or from all the sides. 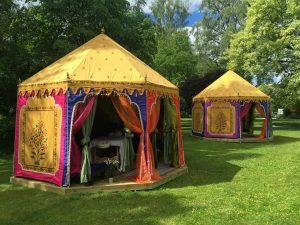 These Round Pavilions can be used to transform the Ball Rooms, for weddings and events, as these Moroccan Frame Tents can be erected indoors as well. 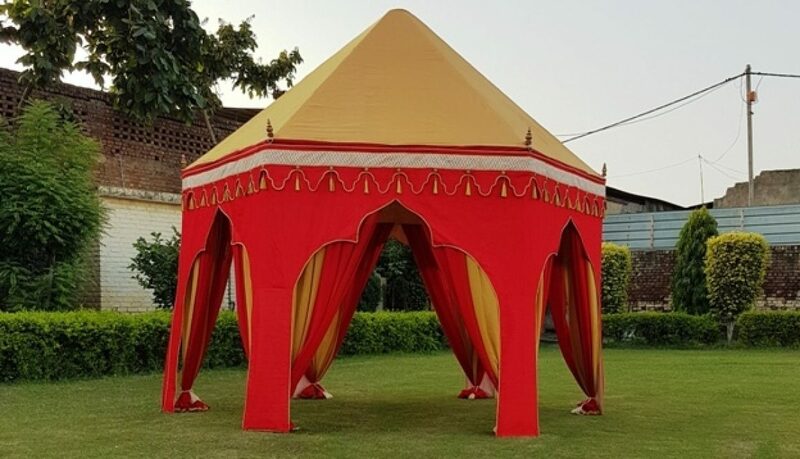 Put them up with arched walls and they become Moroccan Theme Party Tents, remove the walls and these Tents get transformed into Pavilion Tents and beautiful Indian Tents. You can also see for your self. 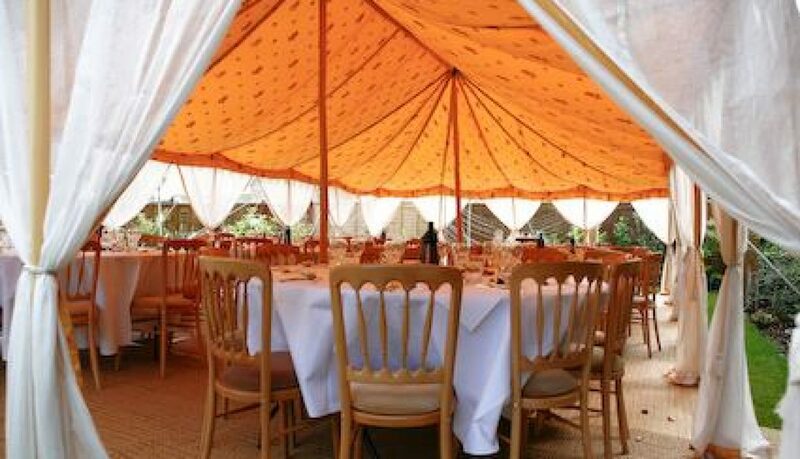 We offer the best quality wooden furniture, to go with your Party Tent. 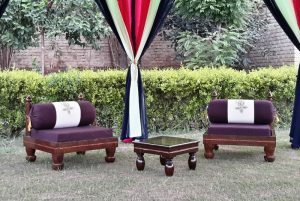 We make very fine quality Low Wooden Seats and Stools with matching color covers as your tent, to go with the whole decor. 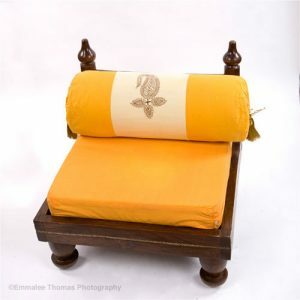 You can choose between Silk covers with fine embroidery patterns and rich cotton covers with hand Block Printing. 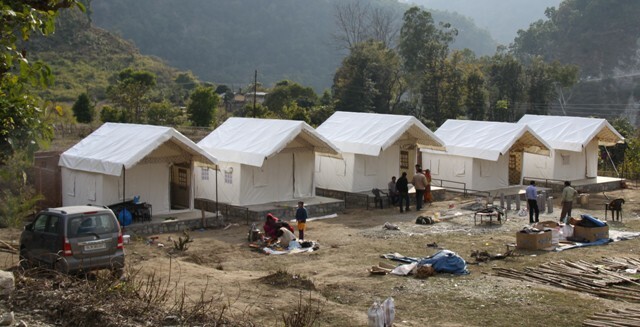 We offer our new range of Living Tents for Resorts & Hotels. 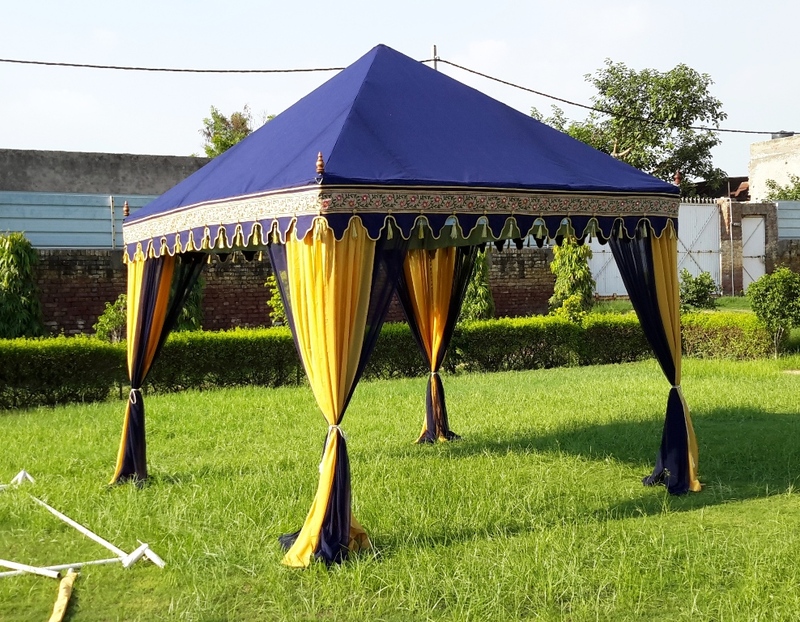 Best Quality Canvas tents, that are very durable and resist Rains at the same time and they will last you almost 5 to 7 years. You can also air condition your Swiss Cottage tents in the summers. They come is a variety of colors, interiors and Sizes. 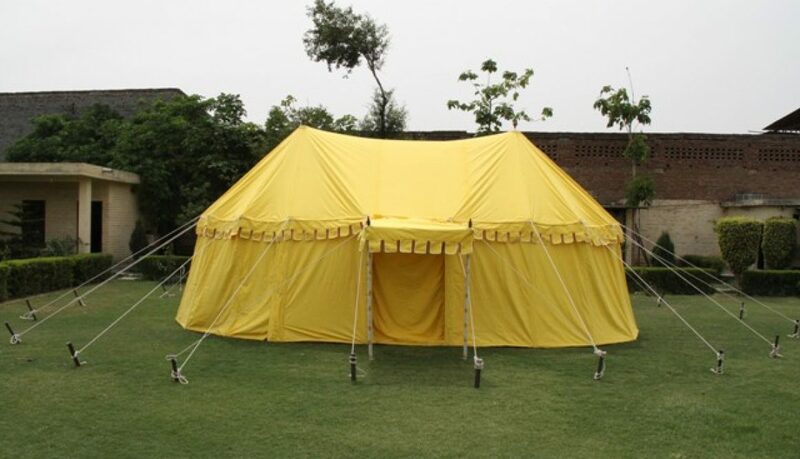 The most common Tent sizes are : 12ft x 24ft, 14ft x 28ft and 16ft x 32ft size. 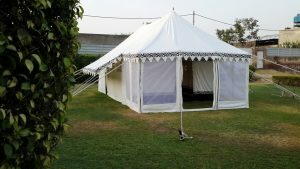 We have a credit of supplying our Tents to Hotels, Resorts, Retreats, Jungle Safari, Green Belt recreation Lodges and many more. Our Living Tents are pitched on Camp sites and trekking sites for tourists. 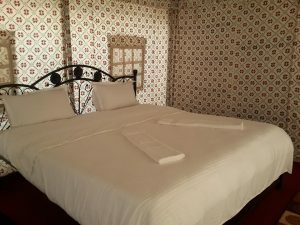 The rooms are so cozy and comfortable that they provide you a home away from home and close to the nature. Our Resort Tents offer the best camping experience ! 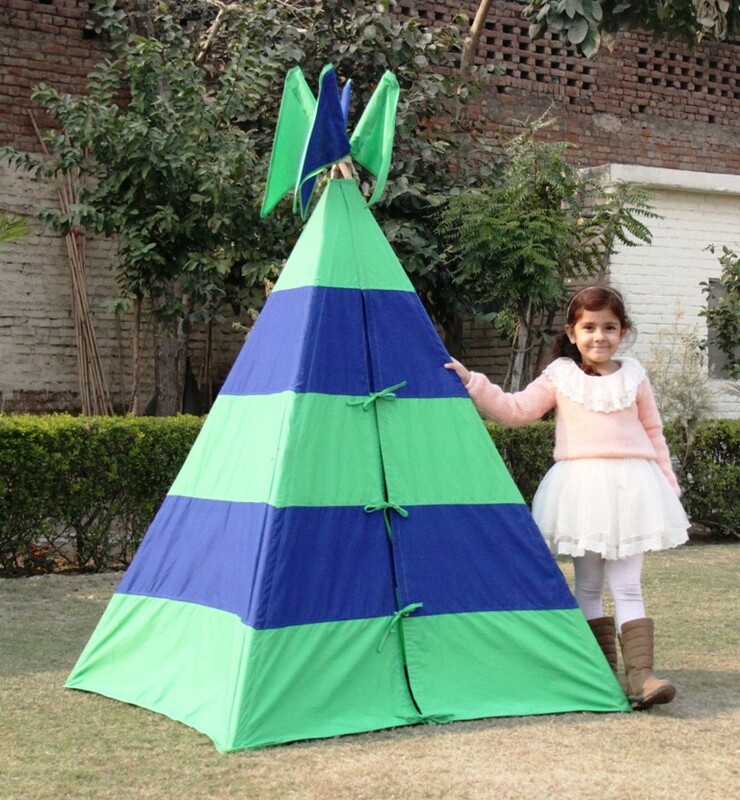 The best gift that you can give a child this Christmas is a play tent. A Tipi Tent, a Viking Tent, a Hut Tent is the Best gift this Christmas. Every child loves to have their own play area a private play house, so what can be better than a small kids Tent !!! 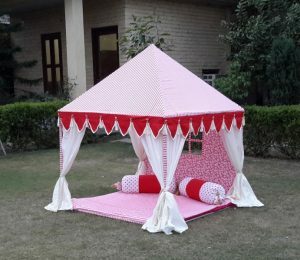 Your Child can build this tent on his or her own, put it up in garden when its sunny & carry it back to the room in the evening. 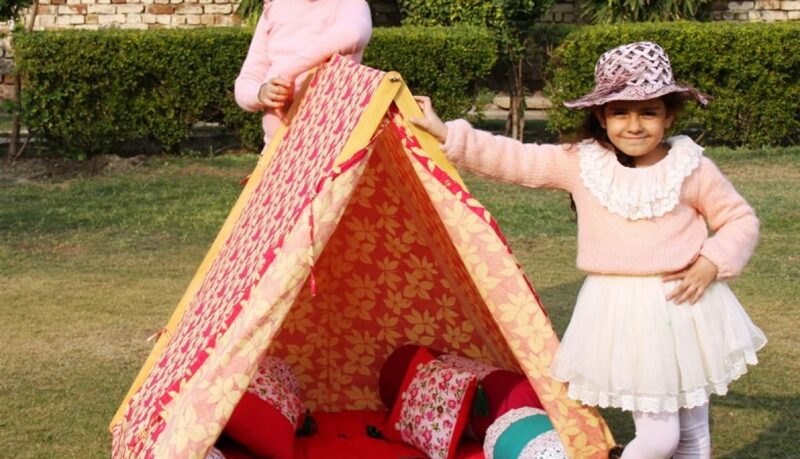 All our Kids Tents are made up of Organic breathable Cotton in colorful & bright prints. The frames and all folding and very stable structures. 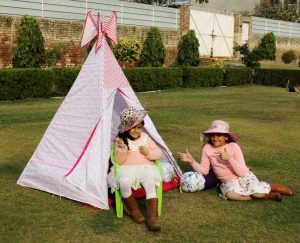 All our Kids Play Tents are very safe & stable structures. Do you remember your childhood ? Gathering bed sheets and hanging them from clothes lines to make a tent ?? 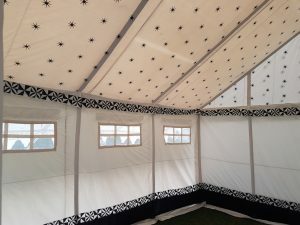 Now, you have the privileged to Gift your child the luxury of playing in a professionally made kids tent. It is made of organic cotton, so that your child can breathe easily, even while the tent is closed. Let your kids make their childhood memories with our exclusive range of Kids Tents we have almost 50+ tent designs to offer you, or you can also design your own tent with us ! 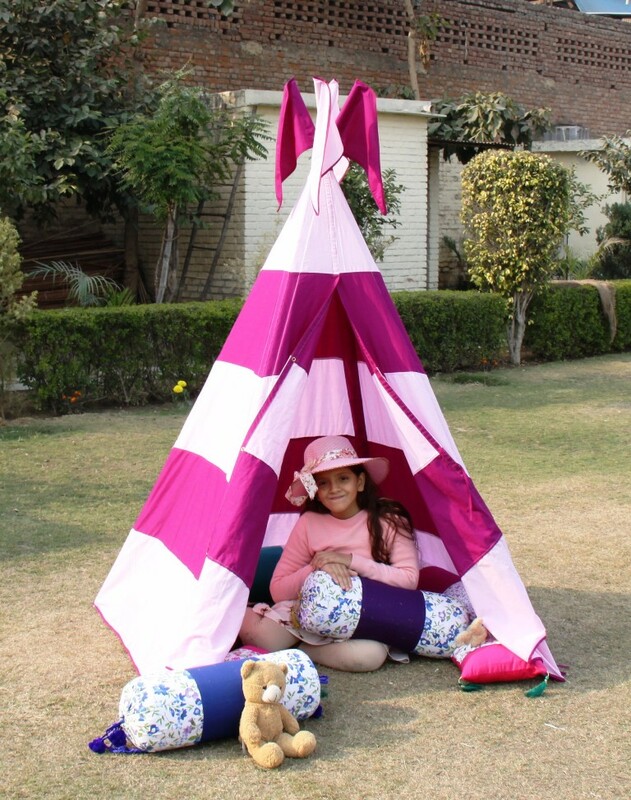 These kids tents and teepee can also be placed in your child’s room or the living room during afternoons and then in the lawn in the evenings. These very easily portable tents and you can also carry them on a picnic with you. These tents very easily fit in the boot of your car or wagon. So you can take them along ! Are you concerned about your kid’s safety while he or she is playing in the garden ? Gift them our new Mosquito free kids tent. 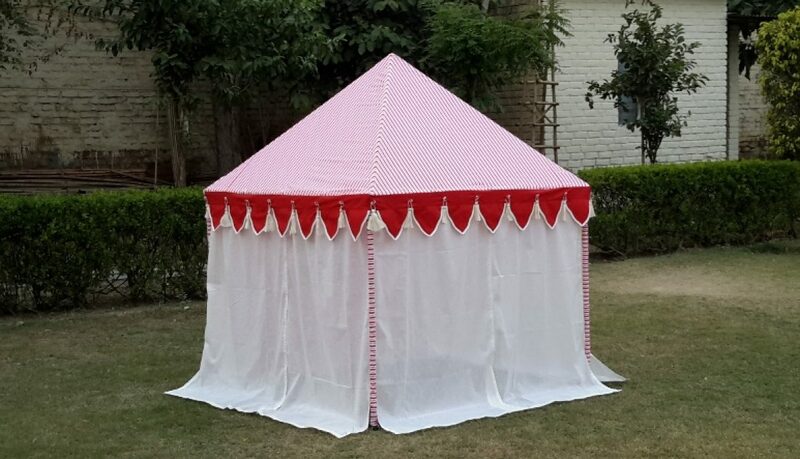 It is covered from all sides, 3 sides with sheer curtains and one side with solid cotton fabric wall. The see through curtains easily allow you to keep a check on your child, while the child is playing in the tent. This tent can be easily folded and carried into your child’s room too. 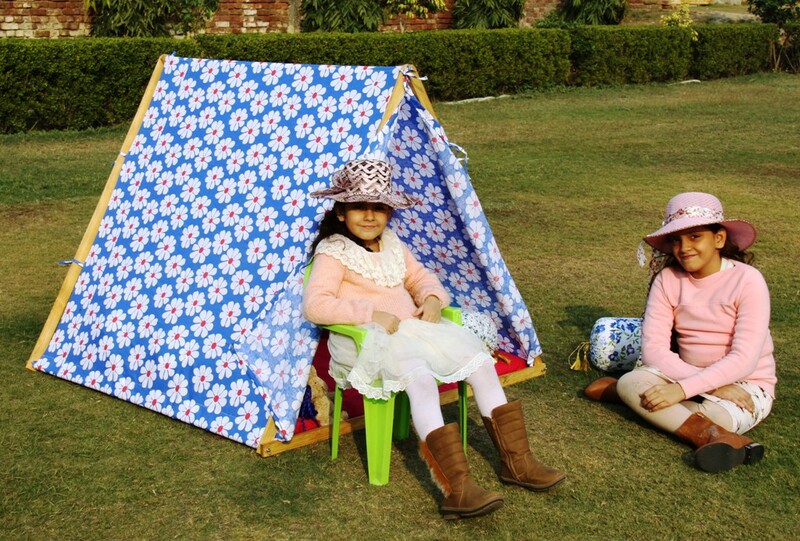 It is a portable kids tent, and you can also take it with you on picnic or holidays too. our play tent for kids is easily packed into a bag and carried around. We only use breathable cotton fabrics to make our tents most suitable & safe for kids. We hope that your child will love his tenting experience in one of our Kids Tent ! Kids Tent is the perfect Chilling Spot for every Kid ! Your child can invite over his or her friends and throw a Kids Party in the tent. 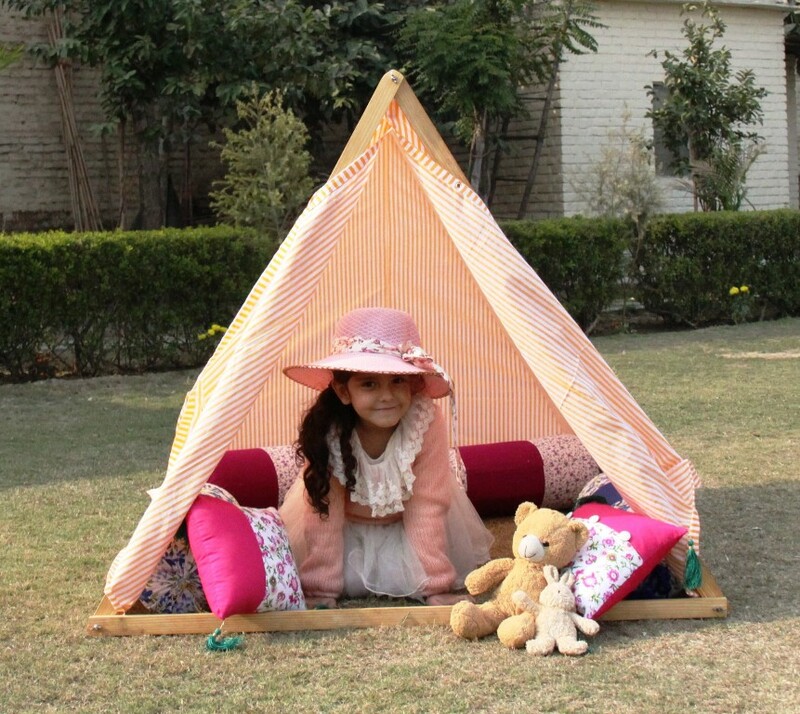 This Kid’s Mahal tent can easily accommodate 3 to 4 Kids sitting and playing Inside this Unisex Tent. The matching Floor mat & Bolsters will make your children feel like a prince & princess. 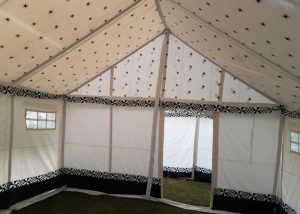 We specially designed this tent to accommodate two siblings – an elder brother & a younger Sister. 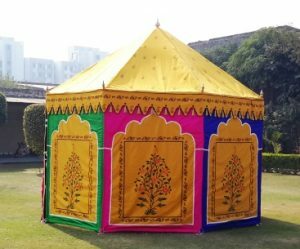 The curtains can be tied at the sides or left open & the window at the back has a flap to completely close this Kid’s Mahal Unisex Tent. 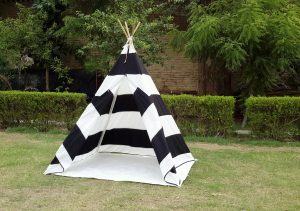 We also make Round Tents & Pavilions for Kids, Hut Shape Tents for Kids, Play houses, Kids Teepee Tents, Kids Viking Tents. 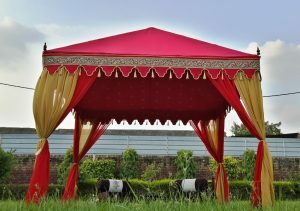 You can also request us to customize your tent, according to the color theme of your Kid’s Room ! We love to be creative for our Little friends ! Do you want a very Exclusive & Elegant Wedding ? Do you want a very exclusive & out of this world Wedding ? Well we have the answers to all your queries about making your wedding the most elegant and the talk of the town ! Gone are the days of the traditional and age old Shamianas, and too boring & plain Pipe Pandals. 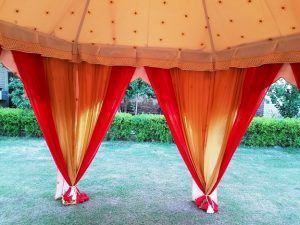 We offer you the latest and the most beautifully decorated Wedding Cabanas, canopies, gazebos, specially designed and made to order for your big day. 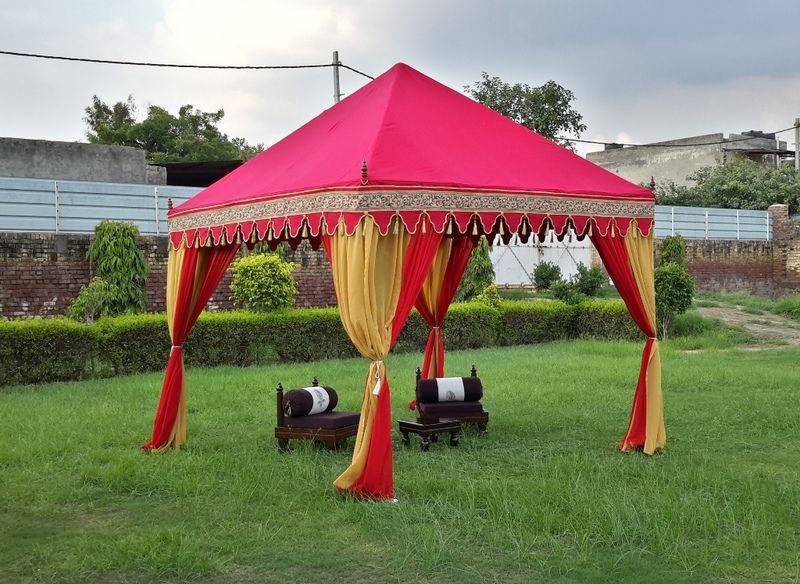 We offer a wide range of elegant Cabanas & Pavilions for the wedding ceremony and a beautifully decorated Wedding Canopy for the Bride & Groom, thereafter. 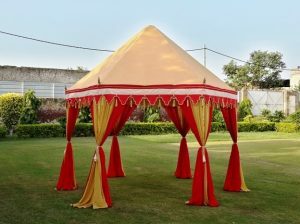 We make top of the line Cabanas & Gazebos in matching or strikingly contrast colors, drapes, hand block prints, delicate hand embroidery, embellishments, golden tassels & tie backs. All your guests are gonna love your taste & class. We know the art of creating the most elegant Party Marquees for your Big Day. 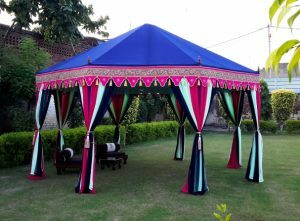 This Tent in particular was designed and developed for an Events company in Australia, for Weddings and Events. 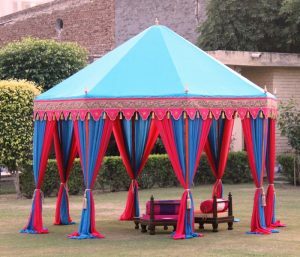 The color scheme was suggested by our client and we sourced the same colors as she wanted them to make this Tent stand out in the crowd. Ever since then, it has been one of our Best Seller Pavilion Tents. 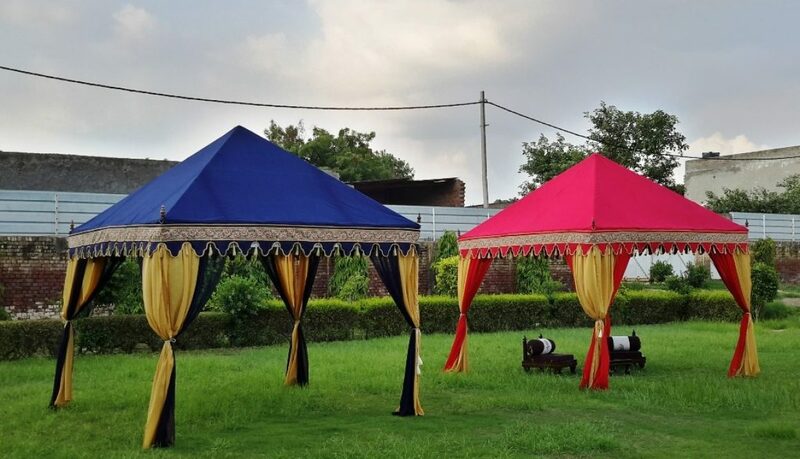 We have also made a few similar Tents in other color combinations, be sure to out our entire range of Indian Tents. 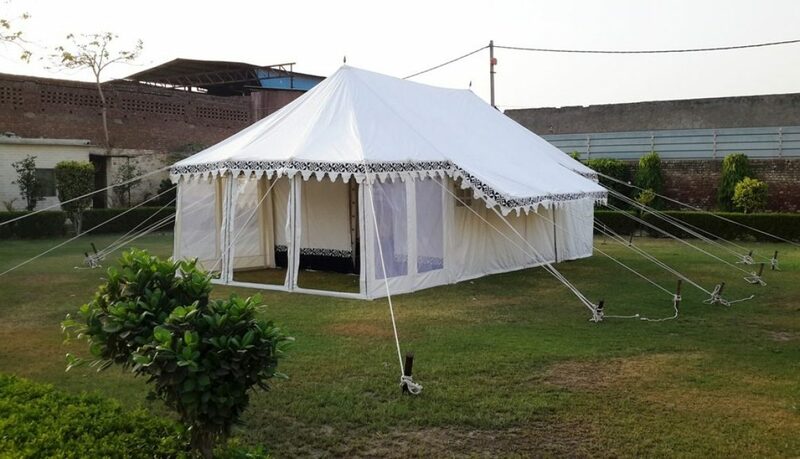 The best quality tents made from tough grade outer cotton canvas is what we deliver to all our clients. We have the option of PVC outers for our Resort Tents. These waterproof tents are specially made for hotels, resorts, retreats & farmhouses. We make your living experience in them a most memorable one. 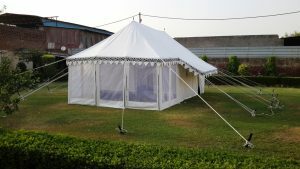 We have a credit of supplying our resort tents to many hotels & resorts both in India and abroad as well. 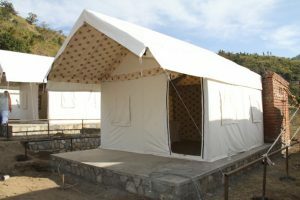 Bathroom is attached with this tent, so that you can enjoy your living experience in one of our tents. All our Safari Resort Tents are erected on a permanent platform, with a permanent bathroom at the back of the Tent. The Bedroom and the front porch are the main part of the tent, where you can enjoy a peaceful and comfortable stay. 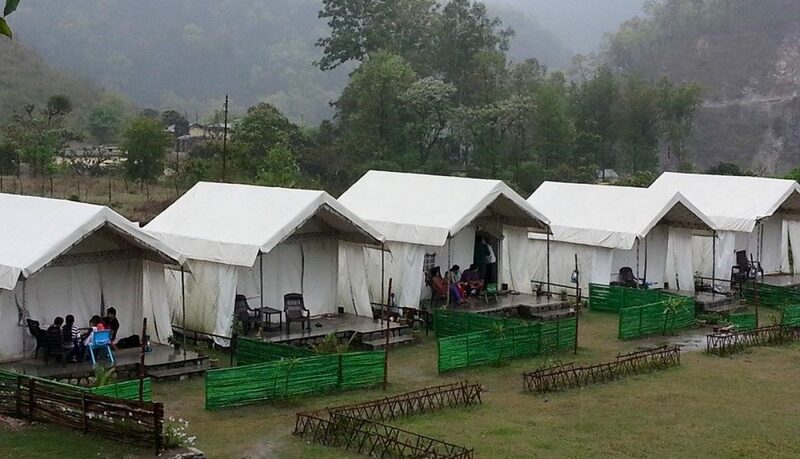 The pictures below were taken during the erection of our tents at this resort in Uttrakhand. 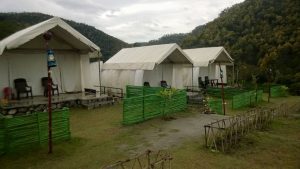 In these pictures you can see our very efficient erection team at work, it took us 2 days to fully erect and furnish these 5 Tents. 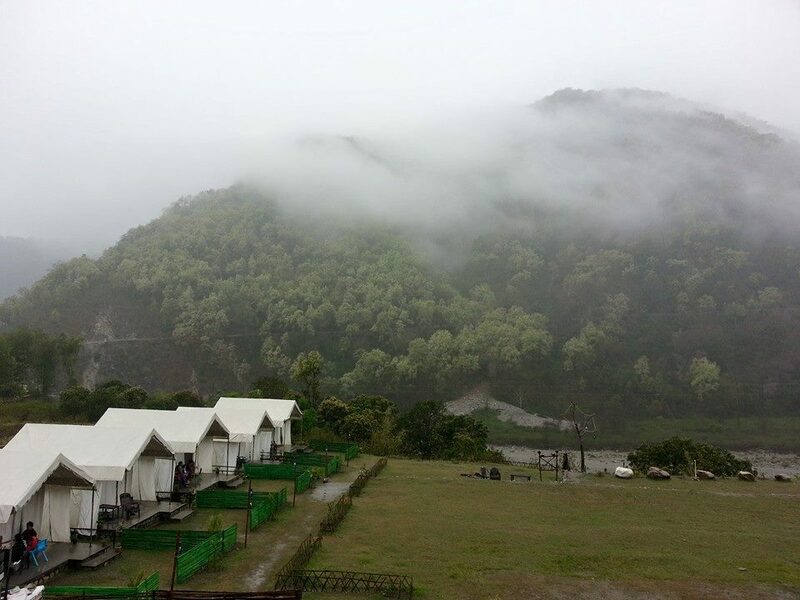 Our tents stood beautifully in the lap of nature, providing a home for the adventurous guests, who wish to spend their Holidays close to the Nature. 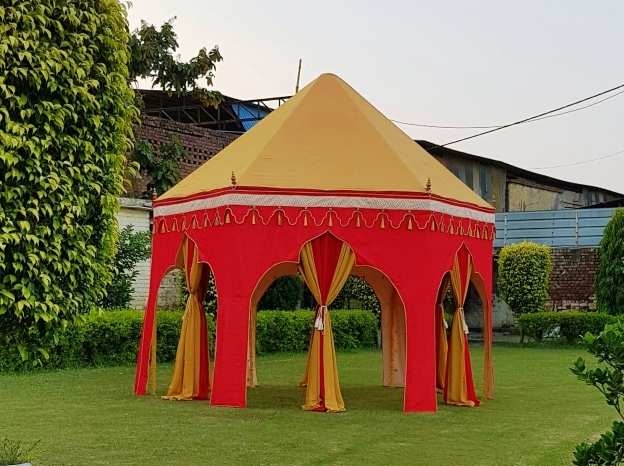 We hope you will also check out our other Resort Tents, like the Luxury Swiss Cottage Tents, Jungle Safari Tents and the very elite Darbari Mahal Tents. 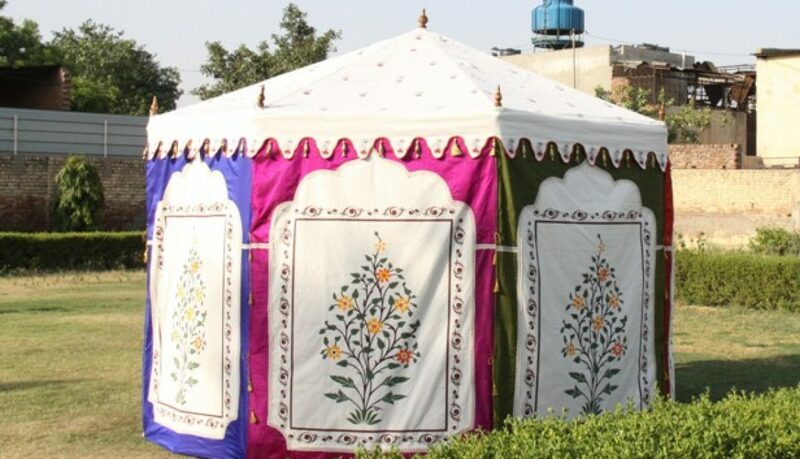 All our Tents are made from the Best quality fabrics by very experienced team of tailors and craftsmen. Our creative team is always researching into new ideas and designs to give our clients the Best Tents. 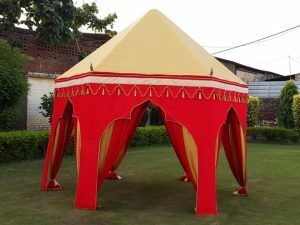 Royal Arabian tents have found a new market in the USA. More and more people now like to buy these exclusive designer tents for personal cocktail parties and friends get together. 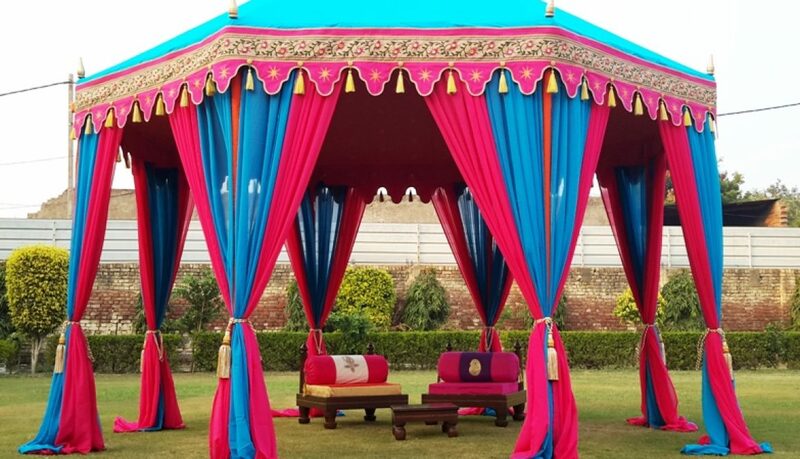 These tents are inspired from the rich Mughal era, when Akbar the Great ruled India. Special attention is paid to all the detailing of embroidery. 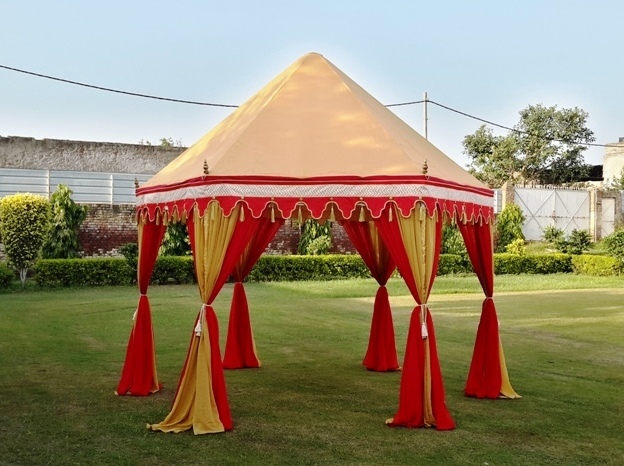 It is truly a designer tent to give you a taste of the Royal Arabian and rich Indian era. 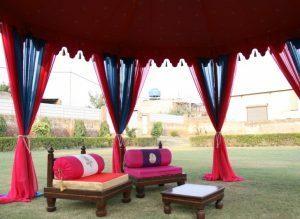 We also make royal tents, cabanas, Arabian tents & marquees. 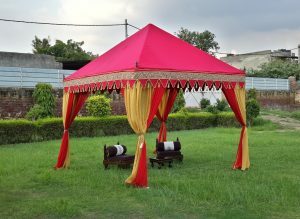 We have the best quality tents for your wedding and party. 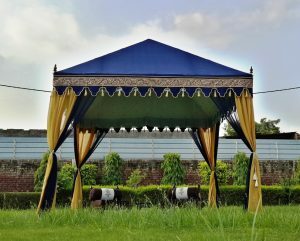 The most elegant range of our Arabian Tents is the Dewaan E Khaas Tent, which means a Special Court Room for the King. 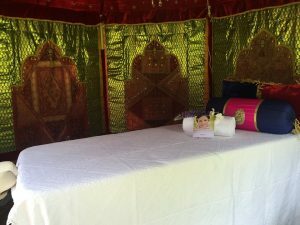 Believe me, when you sit in this tent you will feel like a King ! Hotels and Resorts buy these Tents for private guests and Spa. 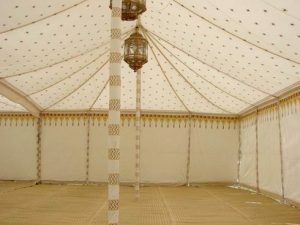 The interior of these tents are very splendid and grand to give you the feel of Arabian Nights era. 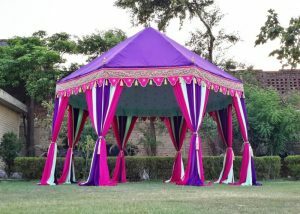 Hookah party and Sheesha parties and also held in these Arabian theme Tents with low floor sittings. 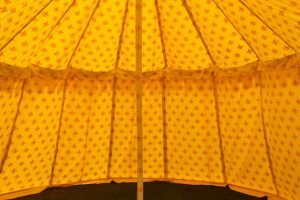 You can also read about the History of Tents, Click Here.